Starting a new thread (if that's okay) for Project Swapfig, in case people find it easier to comment here than elsewhere. At the moment there's a second (and most likely final) attempt at crowdfunding over on Zequs this time. The aim is to hire a web designer for a site makeover, as well as producing Swapfig merchandise. At the time of writing there's 22 days left out of 45, and somehow it's at 46% of a £1500 target. Unfortunately I've screwed up the rewards on the page, and it's too late to change them - so make up for this, if the target is reached I'll add a Gold Swapfigure (or an extra one) to pledges of £40 or more. (There are some "early bird" rewards for Gold Swapfigures left, as well as the "dibs" option.) It would be awesome to succeed this time, along with Mechabrick and the others. In any case, I'm finally going to be adding support for other minifigures to the site, after the campaign ends and along with the next update. I'd really encourage everyone to get behind this project, even if it's just a small amount. So many fan sites these days seem to be based on making money; Drew's is based on trading like for like. Even though I've failed to actually use Swapfig yet (!) I pledged, I believe it's worthy of the improvement this money will bring. Agree 100% with @caperberry I have pledged as well and would love to see #Swapfig hit the goal and beyond! First of all, thank you @caperberry and @kylejohnson11 for putting in good words for the campaign, I always appreciate it. The good news is we're past 50% of the target, and there's plenty of time (but not too much) to make a pledge. I've already decided on my choice if nobody claims "dibs"! I did want to mention that Project Swapfig has over 500 active members and over 600 in total, yet only 20 people (at last count, including myself) have backed the campaign. The last attempt had almost 90 backers, who pledged just over this attempt's target. It would take only a handful of other members to reach the target. This isn't about me trying to get paid, it's about improving and growing the site (which I know a lot of you still use!) and providing the best possible experience. I'm not asking for a huge amount, and I know it's definitely possible to succeed this time, but I can't (and don't want to) do it on my own. PS. To those for whom web design is an issue: think about the fuss that's been made over BrickLink! In case you haven't noticed, I've put this on the home page again. @Huw I hadn't! but thank you. 15 days to go, 60% of the way there! Getting closer! Okay, now you're stealing puns from my thoughts! I've been a little busier than usual this morning, but things have certainly turned around thanks to "the Brickset Effect"™. Thank you folks for your support. Okay, there are ten days to go before the crowdfunding campaign is over, and in the Facebook group I'm running caption competitions. To enter just comment on the posted photo, and the winner of each day (as judged by me) will win postcards of artwork. Just a heads up to everyone out there, today is the last day to help out for the campaign. Last I checked there was still about £469 to go. Every little bit helps on this home stretch! Thank you very much to everybody who came out and showed their support! I honestly don't know what to say right now, except I wasn't sure what to expect. Anyway, tonight's going to be spent celebrating with a bottle of malt, and then the hard work really begins with the redesign and producing the rewards. I'm hoping to have a site update by Friday, where we should have the first non-CMF items available to trade. It took a little longer than hoped, but the latest version of the site (0.4) is up as of last night. Read all about what's different in the news post. It looks like this is going to be a mammoth task! I have uploaded a few SW figure "haves". It is very difficult to select the right one due to the images only showing part of the characters in some cases. It might also help to have the images clickable so that a larger image comes up to help with identification. Are you allowed to use BL's naming convention (as brickset does)? And brickset's images? Something to help identify figures more clearly is really needed, otherwise there will probably be problems later on with people getting something that is not what they thought, affecting the reputation of the site. PS. It is great you can now order results by last login date, that's a good addition. ^ Before anything else gets added I will go through the images shown in the inventory and crop them accordingly, although some of them really do have to be updated. The minifigure names are pulled from Brick Owl's database (minus the "LEGO" prefix and "minifigure" suffix) and I'd be looking to shorten them. In case anyone hasn't noticed, Drew has added The Lone Ranger and The Lord of The Rings categories to swapfig, in addition to SW, Friends and The Lego Movie CMFs. Now we (I) just need The Hobbit and Superheroes added to get some trades going again. I was about to say I'll join this if they add LOTRs. Awesome. Anybody got experience of the site and doing some trades?? I have quite a bit of experience on there although most of my trades are still done here. Although that will probably change as more themes are added. You add what you have, you add what you want, and you can browse for possible trades. You can then suggest trades to others, or they can suggest them to you. You can then decide to accept the trade or counter-offer or just reject it. You can check how many trades they have done before through feedback, a bit like ebay. There are a few brickset members on there. It's also No Limit February, where trading limits have been disabled for the whole month. Trade as little or as much as you want in one go, as long as it's legitimate! One more thing: we're just one away from 500 completed trades. ^ 500th has gone already! I did some of my own looking round the site last night. It's coming along rather well. Have pinged over a few minor issues I have noted @Silentmode. Last night saw the addition of the first batch of polybags. Yes, it should now be possible to trade polybag sets on the site! I've added just a handful of them so far (from Brick Owl's database) but will make more available as time goes on. There are only a few days left before the No Limit February promo ends, after which trading limits come back into effect. Polybags will then count as two items (contents and packaging) towards each user's limits. About half an hour ago we've reached the latest milestone of 555 completed trades! I will be very pleased if we get to 2,000 by the end of the year. It's almost a year since this thing began, and to mark the occasion we're putting to a vote which of the Super Heroes themes will be made available to trade first. Voting is open to all members, but only those who've joined before April 1 will have their votes counted. Does anyone (including @silentmode) know what "Limit Reached" means on a search on swapfig? I have no idea, I'm going to look into it. In case it is not obvious what I mean, this is what I see with Drew at the top. It won't allow me to suggest a trade with Drew, but I can do that from the profile page. It happens on a number of other users too, but not all. That's a feature to prevent too many trade offers to the same person being open at once, but it seems to be causing some problems. It doesn't seem to work anyway, as I couldn't offer you the trade it was suggesting there and then but I could offer it by going to your profile page, then suggesting the trade from there. 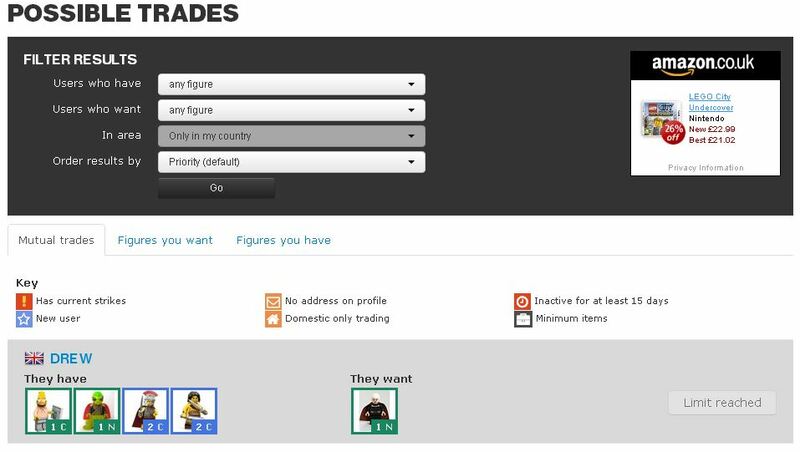 Is anyone else having trouble with setting up trades on swapfig? Although some are suggested, as soon as I go into the trade page none of the ones I have that the other person wants are highlighted. If I add them anyway, and try to confirm the offer, it just keeps reloading the same page not allowing the offer to be put to the other person. It's hard to believe but swapfig is 5 years old today. I just happened to visit today for the first time in ages, and it is down for a week to celebrate.